Here's a project I made after being inspired by the book Creative Wood Letters . (I've reviewed this book here.) It wasn't one of the projects in the book (although there is an idea in there for collaging photos onto a wooden letter that I do intend to try), but the book got my mind whirring with my own ideas. 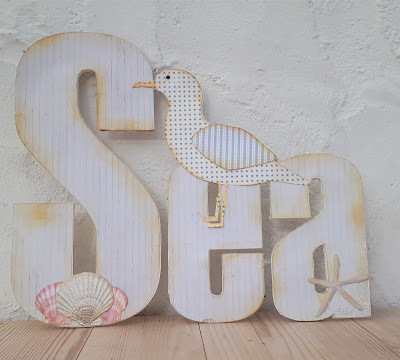 Instead of going and buying wooden letters, I decided to use what I already have and make my own letters using layers of cardstock and recycled cardboard. I designed my project in Silhouette Studio using a basic font and a cutting file of a seagull from the Silhouette store. I did cut most of it on the Silhouette Cameo but it didn't go through the thick cardboard so I had to finish cutting that by hand. For the top layer I used papers and shell die-cuts from a Tilda paper pad. I finished off my edges with gesso and Distress Ink. 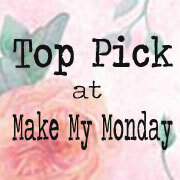 Make My Monday upcycle- used recycled thick cardboard from back of a scrapbook paper pad. Delightful project! Perfect decor for the cottage! Thanks for joining us at Little Red Wagon. Brilliant idea creating your own "wood" letters and using stuff you already have! Your project looks AMAZING!! Thank you for joining us at Always Fun Challenges for challenge #60 "Summer Fun"! A wonderful project! Great work! Wonderful art! I just love the light colours and peaceful atmosphere!